Stock Mom's Pantry with @explorecuisine! My family is big fans of pasta! We love pasta salad, spaghetti, lasagna, mostaccioli, tuna salad and so much more! However, I do try to cut back on gluten products so we are always on the search for our next favorite gluten-free noodle! Recently, we have been trying Explore Cuisine and they have quickly become one of our favorites! I love that they offer so many different types of gluten-free noodles including Black! (Bean) Spaghetti Noodles and GREEN! (Lentil) Lasagne noodles! They have been so fun to try and the whole family has loved the taste and texture! Explore Cuisine products are the perfect solution for busy moms looking for healthy alternatives for their children. Explore Cuisine’s newest line of “Pulse Pastas” are made from fresh organic lentils and organic chickpeas. This collection is changing the landscape of the pasta aisle. With a commitment to making the “pasta for everyone,” Explore Cuisine products are all vegan, certified gluten-free and non-GMO. In just minutes you and your family can enjoy a meal made with organic ingredients and jam packed with protein, fiber and iron. Plus, they have some great recipes to go along with their tasty pastas! 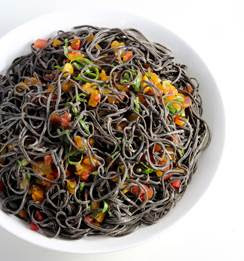 Our family favorite would have to be the Black Bean Spaghetti with Heirloom Tomatoes! Check it out below and try it soon! Gently combine tomatoes with ½ T. olive oil, garlic, basil, and salt, and red pepper flakes. Toss spaghetti with 2 T. olive oil. Top with heirloom tomato mixture. Most importantly, these products are organic and GMO-free so I feel great serving them however and whenever! If you are looking for that unique gift for that healthy mom in your life or for the mom who loves to cook, Explore Cuisine makes a unique, tasty and healthy gift this Mother's Day!